(Nanowerk News) A graphene lightbulb with lower energy emissions, longer lifetime and lower manufacturing costs has been launched thanks to a University of Manchester research and innovation partnership. Graphene Lighting PLC is a spin-out based on a strategic partnership with the National Graphene Institute (NGI) at The University of Manchester to create graphene applications. The UK-registered company will produce the lightbulb, which is expected to perform significantly better and last longer than traditional LED bulbs. It is expected that the graphene lightbulbs will be on the shelves in a matter of months, at a competitive cost. 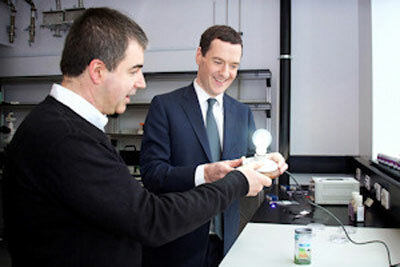 Chancellor George Osborne and Sir Kostya Novoselov with the graphene lightbulb. The University of Manchester has a stake in Graphene Lighting PLC to ensure that the University benefits from commercial applications coming out of the NGI. The graphene lightbulb is believed to be the first commercial application of graphene to emerge from the UK, and is the first application from the £61m NGI, which only opened last week. Graphene was isolated at The University of Manchester in 2004 by Sir Andre Geim and Sir Kostya Novoselov, earning them the Nobel prize for Physics in 2010. The University is the home of graphene, with more than 200 researchers and an unrivalled breadth of graphene and 2D material research projects. The NGI will see academic and commercial partners working side by side on graphene applications of the future. It is funded by £38m from the Engineering and Physical Sciences Research Council (EPSRC) and £23m from the European Regional Development Fund (ERDF). There are currently more than 35 companies partnering with the NGI. In 2017, the University will open the Graphene Engineering Innovation Centre (GEIC), which will accelerate the process of bringing products to market. Professor Colin Bailey, Deputy President and Deputy Vice-Chancellor of The University of Manchester said: “This lightbulb shows that graphene products are becoming a reality, just a little more than a decade after it was first isolated – a very short time in scientific terms. James Baker, Graphene Business Director, added: “The graphene lightbulb is proof of how partnering with the NGI can deliver real-life products which could be used by millions of people.